Only through art," said Marcel Prouse, "can we get outside ourselves and know another's view of the universe..." In September 1994, we posted a brief note in our By the Way column asking for news of Rotarians who were artists. We expected to hear from a dozen or so readers. Instead, we were deluged with letters and fax messages from Rotarian artists eager to share with us their own particular views of the universe. Over the course of six or seven months, we heard from more than 50 painters, sculptors, print makers, potters, weavers, fabric artists, architects, billboard designers, and musicians -- even a few poets. Correspondents told us how they contributed artwork to their clubs or districts for fundraising events, organized art shows, or gave demonstrations of their skills as club programs. We ended up with more than enough material to create a "gallery" of our own, and the following pages provide a brief glimpse of it. The artists selected represent a much larger group of creative men and women from around the world whose work we will try to showcase in other ways, at other times. "Thanks to art", noted Proust, "instead of seeing a single world, our own, we see it multiply until we have before us as many worlds as there are original artists". Welcome to our gallery, enjoy your view of other worlds. 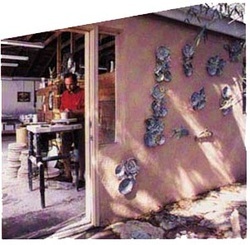 James Rice of Naples, Florida, describes himself as a professional potter whose goal is to produce functional artwork. 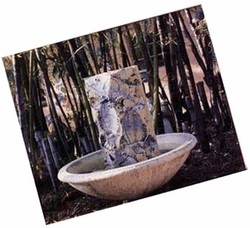 Although he is known across the US for his distinctive hand-painted fish plates and platters, Jim has also created vases, tiles, furniture, murals, and fountains. As owner of The Clay Place, he crafts clay into "beautiful objects that can be part of people's daily lives." Jim opens up his studio to Scout troops and student field trips. The studio has become a public resource, he says. A group study Exchange team member to Sweden in 1982, he lead a GSE team from Florida to South Africa in 1990. The Paul Harris Fellow and Rotary Foundation Benefactor is a 10-year board member of his Rotary Club of Naples-Pelican Bay. Jim has served as the District 6960 GSE chairman for seven years.